Western Bureau Arts Silicon Valley is now accepting entries for its upcoming group exhibition, Sunspots17: Ode to Summer. Sunspots17 will be held July 10th through July 31st, 2017 at the Western Bureau’s Main Gallery in the historic Bank of Italy Building in downtown San Jose, California. The theme of the exhibition is summertime and the various memories, emotions, sights, and scenery that our warmest season evokes. All styles and mediums will be considered. Selected artists will be notified on June 19, 2017. Thematically aligned selections from the Western Bureau’s Permanent Collection including paintings by such noted mid-century artists as Erle Loran, Chris Ritter, James McCray, Edward Hagedorn, Victor di Gesu, and Harold C. Davies will also be included in the exhibition. Selected artists will have the opportunity to exhibit and sell their work in the heart of Silicon Valley with a diverse group of artists from around the world. If an artist’s piece sells during the exhibition, then they will receive 80% of the sale price. Unsold works will either be returned to the artist upon completion of the exhibition or purchased by Western Bureau Arts for our Permanent Collection. Western Bureau Arts Silicon Valley is a leading collection of contemporary and modern art spanning from the mid-twentieth century to the present. Founded in 2008 in San Jose, California. Their mission is to preserve and promote works that have been unjustly overlooked or otherwise under-represented in today’s art market. The gallery is located in the landmark 1925 Bank of Italy building in downtown San Jose. They host monthly exhibitions of contemporary art alongside rotating selections from their Permanent Collection. Whether it’s reviving the reputation of forgotten masters, celebrating regional art movements, or fostering the current generation of working artists, they strive to maintain this vital resource for educators, historians, curators, collectors, students, and members of the general public interested in exploring the many contours of creative expression. For more information, contact art@westernbureau.com. 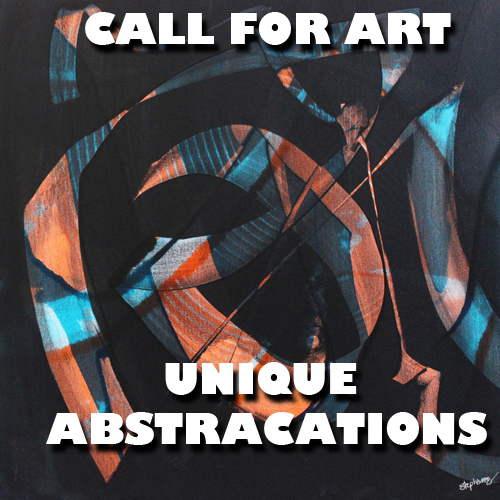 Las Laguna Gallery announces a call for artists for Unique Abstractions in a variety of mediums. Works in acrylic, airbrush, assemblage, charcoal, color pencil, collage, digital art, drawings, encaustic, fiber art, graphite, illustration, mixed media, new media, oil, painting, pastel, photography (traditional and digital), printmaking, and watercolor will be considered. Chosen artist’s work will be displayed at our gallery location in the heart of Laguna Beach. Las Laguna Gallery is located on Pacific Coast Highway in Laguna Village. Laguna Village is an artist alcove situated on the cliff overlooking the Pacific Ocean. This location is a must stop location with artist galleries and jewelry shops. The location features a restaurant, bar, and live music in the fire-side theater Tuesday through Saturday. North Street Collective, located in the heart of Mendocino County, California, announces an open call for applications to the Resident Artist Program 2017. The Resident Artist Program 2017 provides artists with the time, space, and inspiration to explore ideas and pro­duce work. Time spent at North Street allows artists to con­nect with Willits and Men­do­cino County while allow­ing them free­dom to accom­plish what they wish. North Street Collective accepts applications from individual artists or duos of any discipline to create, advance, or complete work in a self-guided and self-motivated way. They especially encourage partnerships of artists and scientists or artists and community activists who seek to work together in new ways. They are looking for people who are entrepreneurial by nature and who will also contribute to the growth and spirit of this new effort. North Street Collective pro­vides hous­ing and work­space dur­ing the Resident Artist Program 2017. Res­i­dents are respon­si­ble for liv­ing expenses such as food, sup­plies, and travel to and from North Street Collective. All artists receive a weekly stipend of $300 to cover food, mate­ri­als, and trans­porta­tion to and from North Street. Res­i­dents pur­sue their prac­tice and develop their cre­ative tech­niques in a rural, north­ern Cal­i­forn­ian set­ting. There are infor­mal, quirky places around North Street Collective to dis­play work and small areas for per­for­mances or other gatherings. inter­ac­tion with a few good souls. Artists are asked to share your process but there is no require­ment for fin­ish­ing or pro­duc­ing a cer­tain amount of material. North Street Collective Residents are artists who come from a variety of backgrounds and disciplines or are working experimentally across several disciplines. In keeping with Mendocino’s unique heritage and sense of place, artists from Native American backgrounds, Mexican artists, and artists whose work is connected to ecology have special priority for residencies. North Street Collective celebrates artists working with wood or other materials from the local natural environment; artists working with railroad-related themes; and those with a social practice related to this region of the world, including water, food system, and social justice. They encourage applications from artists representing the widest possible ranges of perspectives and demographics. North Street Collective is a place to decen­tral­ize and dein­sti­tu­tion­al­ize art prac­tice. They love to see how ideas develop, grow, and some­times even fail. They are a test space for new ideas and a social space for inter­ac­tion. Through their work, they help artists build sus­tain­able prac­tices. They fos­ter work that appeals to a vari­ety of audi­ences, and offer joy, com­fort, inspi­ra­tion, and interaction. For more information, contact info@northstreetcollective.org. stARTup Art Fair San Francisco 2017 is a contemporary art fair currently seeking independent artists. All sales proceeds belong 100% to the artists. The stARTup Art Fair San Francisco 2017 will run April 28-30, 2017 at the Hotel Del Sol in San Francisco’s Marina District, and takes place at the same time as the Art Market SF gallery fair at Fort Mason. There are application and exhibitor fees. Those selected from the open application process will each take over a hotel room for the course of three days to present a solo show of their work. The core mission of stARTup Art Fair is to provide a marketplace that gives artists the power to present and sell work on their own terms. The San Francisco Bay Area has a history of attracting creative, visionary, self-starting artists, designers, and entrepreneurs. stARTup Art Fair celebrates the spirit of this region with its investment in emerging and under-recognized artists. It is a destination where creatives of all stripes can converge to see new, inspiring art in the California spirit of discovery. The fair provides the chance for the next generation of art collectors to get in on the ground floor of a type of artist start-up, where collectors can acquire great works of art and make real connections with artists in an intimate setting. For more information, please contact ray@startupartfair.com. 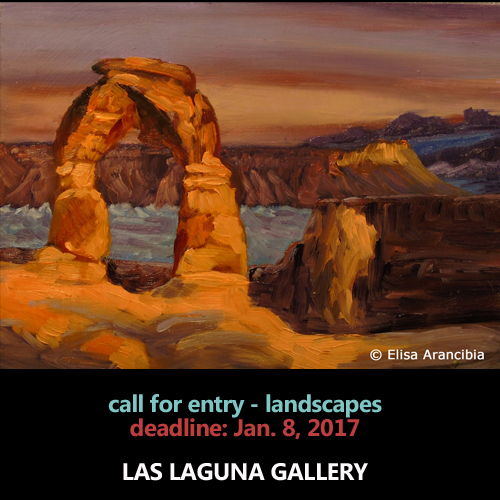 Las Laguna Gallery is looking for works that depict Landscapes, Seascapes, Skyscapes. Entry Fee: $35 for the 1st image, $5 per for each additional image. Works in acrylic, airbrush, assemblage, charcoal, color pencil, collage, digital art, drawings, encaustic, graphite, illustration, mixed media, new media, oil, painting, pastel, photography (traditional and digital), and watercolor will be considered. Las Laguna Gallery is located on Pacific Coast Highway in Laguna Village. Laguna Village is an artist alcove situated on the cliff overlooking the Pacific Ocean. This location is a must stop location with artist galleries, and jewelry shops. Our location features a restaurant and bar as well as live music in the fire-side theatre Tuesday through Saturday. Las Laguna Gallery is a contemporary and fine art gallery located in Laguna Beach California which features art from a diverse group of artists representing a variety of mediums. Quickly becoming one of the premier contemporary and fine art galleries in Laguna Beach, California; Las Laguna Gallery is dedicated to the exploration and engagement of contemporary and fine art visual culture through unique collaborations between artists, students, and the community. The City of Fremont, California is seeking one sculpture to display for the Metamorphosis Public Art Program, for a period of two years from March 2017 through March 2019 in Downtown Fremont. Artists are asked to submit applications for placement of their sculpture on the intersection of Fremont Boulevard and Capitol Avenue, a main gateway into Downtown Fremont and a main intersection in the city. All Metamorphosis Public Art Program submissions must be previously completed artworks. This opportunity is open to professional artists residing or working in California; age 18 and older. Downtown Fremont is being built from scratch and envisioned to serve as the central gathering space for the community. As part of the Downtown Community Plan, an art fund was established with the vision of providing funding for public art installations. This temporary installation opportunity is focused on metamorphosis as the theme. Throughout the year, Downtown Fremont hosts events such as: the Fremont Festival of the Arts, the largest free festival west of the Mississippi; the Fremont Fourth of July parade; the Festival of India; and Fremont Street Eats, a weekly gourmet food truck event from May through October. The opportunity will not only help define the character of the Downtown as the central gathering space and heart of the City, but also provide significant exposure for the artwork as well as for the artist. The selected piece will be prominently featured on the City’s social media channels including Facebook, Twitter, and Instagram as well as highlighted in print media and the City’s newsletter which is distributed to all Fremont households. The total amount paid to the artist for the Metamorphosis Public Art Program will be $5,000 paid in quarterly installments of $625 throughout the two-year exhibition period. It is the responsibility of the artist to deliver the artwork to the premises with an agreed upon date with the City of Fremont for installation with modifications as requested by the City and implemented by the artist. The artist will be responsible for the transportation, installation, and de-installation of the artwork and will be provided with assistance for the installation and de-installation from the City. The City of Fremont is the San Francisco Bay Area’s fourth largest city with a population of 225,000. The City incorporated in 1956 merging five separate townships together. Since its incorporation, the community has longed for a central gathering place. The City has recently completed Phase I, the infrastructure build-out of the Downtown with the extension and transformation of its main street, Capitol Avenue, into a multi-modal street complete with bike lanes, wide sidewalks, and inviting landscaping to promote outdoor areas as public space. For more information, contact akwak@fremont.gov. The LH Horton Jr Gallery Print 2D-3D Works seeks artists working in both 2D and 3D print mediums including but not limited to traditional and experimental printmaking processes and new 3D print technology. Entry to LH Horton Jr Gallery Print 2D-3D Works is open to artists residing in the U.S. Printmaking processes in 2D works should be the dominant focus. The print medium should have significant application in sculptural works such as transfer printing on ceramics. Photographic prints are not eligible with the exception of photo transfer onto sculpture. Entry Fee: $30 for 3 images, $5 each additional image. Mayumi Hamanaka, originally from Japan, is a visual artist, curator, and educator working at Kala and sharing her talents with Kala for a decade. She received her M.F.A. from California College of the Arts, San Francisco, and her B.F.A. from the School of the Art Institute of Chicago. She is the recipient of the De Young Museum Artist Fellowship, Murphy Fellowship Award, Taipei Artist Village Fellowship, and others. Her work has been shown nationally and internationally including Taipei Artist Village in Taiwan, Yerba Buena Center for the Arts, Swarm Gallery, San Francisco Art Commission Gallery, Headlands Center for the Arts, and Asian American Art Center in NYC. She has taught at California College of the Arts, Diablo Valley College, and Berkeley City College. All Artwork exhibited at the LH Horton Jr Gallery insured against fire, theft, and other hazards at the LH Horton Jr Gallery while in the possession of the Gallery, from the time of receipt through the time of setup and exhibition. Awards for both 2D and 3D work categories. The exhibition and sale of artwork is available both in the Gallery and online as well as archived on the Gallery website for up to ten years. Each artist has their own page linked to the exhibition web page and direct links to the artists’ website for direct contact by patrons. The Gallery handles all sales of artwork conducted online and in the Gallery and withholds a 20% commission to pay for sales tax and associated Gallery programming. The Gallery receives local and national recognition for their exhibitions. The LH Horton Jr Gallery is a fine arts exhibition program within the Visual Arts Department of San Joaquin Delta College and a venue of Delta Center for the Arts. The Gallery presents contemporary art exhibitions and inter-related arts lectures, workshops, and performing arts presentations. It has over 1,200 visitors for each exhibition and is a premier exhibition space with 2000 sq. ft. of exhibition space including a 22ft. extended ceiling with exhibition mounts. The Gallery exhibitions have been recognized nationally including articles in Ceramics Monthly and the Atlantic. The Gallery is centrally located and has visitors from throughout the Bay Area. For more information, contact jmarlese@deltacollege.edu.